NE OF THE MOST IMPRESSIVE places we visited in Rome was the Pantheon. It was much larger and more beautiful than we would have expected. 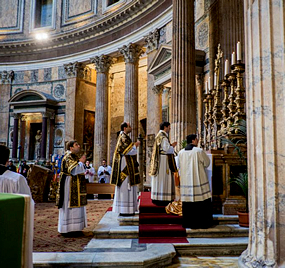 Many people might not realize the Pantheon has been a Catholic Church since the 7th Century (“St. Mary and the Martyrs”). Recently, a Solemn Mass in the Extraordinary Form was celebrated there by Don Riccardo Petroni, a priest of the diocese of Rome. Here’s a 2009 photograph [pdf], taken as I first entered the Pantheon.